NEW! 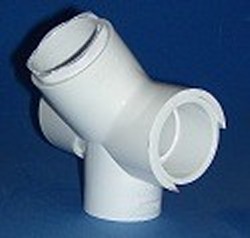 1.25" 45° 4 ways, "pvc side outlet 45° T's." This is the fitting you need to create a canopy or other sloping top structure. Creates a slope of 45° from the horizon. Actual angle is 135° Use the standard 426-012 for the peak. Slip all four ways. Used for many construction projects. NOT a NSF rated fitting, cannot be used on projects that require plumbing inspections. Not a flow through fitting. Just for construction projects. For each "rung" of your canopy, you will need 2 of these plus 1 standard 90° 426-012 side outlet Tee. If you have a square canopy you will need 4 of these and 2 of the 426-012 total. For a 3 "rung" rectangular canopy, you'd need 6 of these and 3 of the 426-012 total. Works with Sch 40, Sch 80, Class 200 pipe. Suggested spacing is 4' with sch 40, 5' with sch 80 and 3' with class 200 for horizontal members.